ComfortUp, online at comfortup.com, is the go to shop for ductless HVAC systems, indoor air quality, tools, and supplies. ComfortUp offers great deals on ductless HVAC systems, indoor air quality, tools, and supplies. ComfortUp carries window units, accessories, ductless mini split systems, PTAC air conditioning systems, thru-the-wall units, system maintenance items, system protection items, thermostats, controls, air cleaners, UV lights, chargers, cleaning items, cords, fans, blowers, tools, lighting, sealants, and tape. ComfortUp carries brands such as Gree, Mitsubishi Electric, Panasonic, Friedrich, and LG. Check out RetailSteal.com for the latest ComfortUp discounts, ComfortUp promo codes, and ComfortUp coupon codes. ComfortUp offers shipping promos that change often. Stop by RetailSteal.com for the latest ComfortUp shipping special offers. ComfortUp ships to the United States. Shop at ComfortUp and enjoy free shipping on orders $399+. Click here to shop. Enjoy a free line test at ComfortUp. Click here to start. 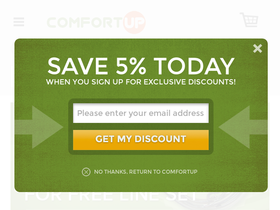 Enjoy 5% savings on any order with email sign up at ComfortUp. Click here to shop. Shop at ComfortUp and enjoy 35% savings on select heating and cooling systems. Click here to shop. Shop at ComfortUp and save 25% on hot deals. Click here to shop. Enjoy exclusive offers with email sign up at ComfortUp. Click here to sign up.